You’ll never look at blueberry jam the same way again. Anders Sandberg, of Oxford’s Future of Humanity Institute, describes himself as an “academic jack-of-all-trades,” and on arXiv.org, a gathering place for pre-prints of academic papers, his contributions include work on risk estimates, supersized machines, neck tie-knots, the Fermi paradox, and the energy required to run a brain as compared to the energy required to run artificial intelligence. His latest work is a disturbing thought experiment that ensures that anyone who reads it will never look at a blueberry pie the same way again. 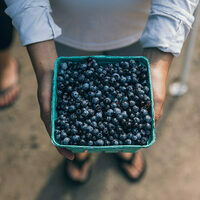 This process of imagining blueberry earth begins with fat, thick-skinned highbush blueberries (the kind you find in grocery stores, not in the blueberry barrens of Maine). Given the estimated density of blueberries, the mass of an Earth made of berries would be a fraction of its current mass, with weaker gravity. Blueberries, Sandberg points out, are not particularly strong, able to resist the weight of a sugar cube but not a milk carton. Within a few yards of the surface of whole blueberries, the force of gravity would pulp the blueberries into mash, releasing the air that had separated each berry from its neighbors and shrinking the planet to a smaller radius. If no other forces were involved, the blueberry planet would collapse under its own weight in an estimated 42 minutes. But there are other factors at play. The air released by the pulping of berries would create a thick, dense atmosphere, which Sandberg compares to Titan’s. Little light would filter through to the surface, so the dramatic events that followed would happen in almost total darkness. Deep under this ocean of jam, though, the pressure would change the dynamics. Even if it’s hot, the conditions would compress the jam into ice, most likely “some kind of composite pulp ice.” Meanwhile, the Moon would have long since fled the scene. In the end, Sandberg finds, the Earth will be akin to one of the oceanic exoplanets discovered elsewhere in the universe—a place where no human would want to live (but could perhaps be a resource for future space mining companies in search of ready-made jam products). There are still open questions to answer about blueberry earth. How would the chemistry of blueberry pulp play into these dynamics? Long-term, the planet could dry out, so what would that mean for the oceans? How bad are hurricanes on the planet? Sandberg says he would visit the jammy planet he imagined—“With protective gear. And probably a supply of ice cream.” Which brings us to another question raised on Physics Stack Exchange, one that caught his eye: What material is best suited for eating ice cream from, without the ice cream melting too fast on the edges? (Would diamond bowls be good for delicious ice cream?) He was also intrigued by a question about how Venus flytraps count and another about how diffraction patterns would change if atoms were triangular instead of spherical. And of course there’s always the classic: What if the Moon were actually made of cheese? The sweet, tiny wild berries are only available for two months each year. What Fictional Food Do You Most Want to Try? It is a subtle art and an even subtler science. How new flavors are created and killed.